Now you’ve enrolled and you’re about to start your first year as a sixth form student here, what advice can we give you to help you make a success of your studies? Every student is different but we know what all successful students have in common. We’ve seen tens of thousands over the years, we know what makes them succeed and we’re only too happy to share these ‘secrets of success’ with you. They’re not very secret and they won’t surprise you, but that doesn’t make them any less important. 1. Take control, be responsible for your learning. You’ve chosen this college and you’ve chosen a programme which interests you – important adult decisions. You will get plenty of help from your teachers but they cannot do the work for you. It won’t all be smooth going, there will be ups and downs and there will be times when you feel under pressure because of your studies. Seek out the help you need but try to avoid blaming others. In the end, your success is mainly in your hands. The decisions you make and the work you do are the things which will have the greatest impact on whether or not you succeed. 2. Attend and be on time for all your classes. We know that students who attend are more likely to succeed. Your teachers have planned your programme of learning, if you’re not there for parts of it you’re obviously missing out. So your attendance target is 100%. Being late for class also means you miss out. Being punctual is about respect; respect for your teacher – who has planned a full lesson, respect for fellow students – who are inconvenienced when you arrive late and of course respect for yourself as a committed student. 3. Aim high and make sure you know what steps you need to take to get where you want to be. We assume you are ambitious and we will help you set ambitious targets which are also realistic and achievable. It will take time to lay all the foundations but this is your future you’re building so you need to keep hold of that ambition while doing all the important heavy work that’s needed to bring it about. 5. Get into good study habits. You have already shown skill in learning in order to get here. You now need to become an even more skilled learner. This means working out the skills you need to improve most and tackling those first – don’t put this off. Our skilled learner framework has 4 headings; you need to be Dedicated, Organised, Enquiring and Social and we can all develop these skills further and make better use of the study time and resources we have. 6. If you don’t understand, ask. Don’t be the student who doesn’t bother saying anything when you don’t ‘get it’ for fear of looking stupid. There’s nothing stupid about needing things explained and teachers are happy to explain things in lots of different ways. You will certainly feel much more stupid if you let things drift and fall behind later because you didn’t ‘get’ something important early on. 7. Try to enjoy your time at college. You are only here for a short time, so get involved in some of the fantastic activities on offer – whether to develop your existing skills or try something new. Take up some of the many opportunities available, make time to have fun and make new friends. We know from many former students that friends they’ve made at college are often friends for life. 8. Get involved and make a difference. You are young adults, you are starting to think about how you might make a difference in the world. You are not powerless; as a citizen you can help to bring about change at the local, national and international level, so how do you want to make your mark? As a member of this community you need to ask yourself: “What impact did I have on others today?” and you need to ask yourself: “Am I doing my best?” At college you will have many opportunities to make yourself heard and to think about all the challenges that we face and what we should do about them. Grasp those opportunities – don’t leave everything to others! 9. Get enough sleep and have a healthy diet. Tired, hungry students are not good learners. 10. Never forget why you are here. You will sometimes have to make choices between your studies and your social life. When the crunch comes, remember to put your education first. Your friends will still be around next week, but if you miss that final assignment deadline, it will be gone forever. It all seems fairly obvious doesn’t it? But of course knowing it is not always the same as doing it! So, welcome to NewVIc. You are now a lifelong member of our ‘successful learning community’. As a community we work together, learn from each other and with each other. We help, respect and care for each other. 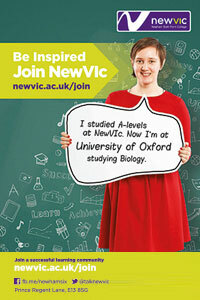 You will get a lot out of this community and you too can become a NewVIc success story. But as with other communities you will also need to put a lot in to make that happen. For you, this is the start of a new adventure, an exciting new phase of your education. It’s a good time to look back at where you’ve come from as well as to look forward to where you’re going next. So look back and be proud of who you are and what you’ve achieved; be proud of your family, your culture, your language, your beliefs and all your achievements – you’ve already achieved a great deal, you are somebody and you have a lot to be proud of. But don’t stop there, look forward and become what you are capable of becoming which is so much more and we look forward to helping you on that journey. This entry was posted in NewVIc, Parents, Students and tagged aspiration, Education, learning, Newham Sixth Form College, NewVIc, Sixth form, Sixth form college, Student. Bookmark the permalink.